(Nanowerk News) Following six years’ work, an international team comprising eleven research institutions has been successful in observing precisely how light affects the outer electrons of a metallic compound and activates this compound as a catalyst. They developed their own experiment for this investigation at the Linac Coherent Light Source X-ray laser at SLAC National Accelerator Laboratory in Menlo Park, California, which provided time resolutions down to 100 femtoseconds, and the synchrotron radiation source BESSY II of Helmholtz-Zentrum Berlin. Using quantum chemical calculations, they were successful in interpreting the data and obtaining a detailed picture of the intermediates and reaction kinetics. The work, which has now been published in Nature, could prove helpful in developing novel catalysts for chemical storage of solar energy. All plants do it: they store solar energy in the form of carbohydrates with the help of a metallic compound. Chemically storing sunlight would also be ideal for society's energy needs. To develop this, however, we would need to better understand exactly what happens when photons strike molecules. The primary processes run on timescales of only a few hundred femtoseconds (one femtosecond = 10-15s). Now an international collaboration has been able to map the evolution of the chemical bonds in these kinds of ultrafast processes on the level of orbitals, v “We were able to determine how incident optical photons rearrange the valence electrons of a metallic carbonyl compound. The results could help to utilise these processes in the future for more efficient conversion of sunlight into chemical energy,” explains Dr. Philippe Wernet, first author of the article that has now been published in Nature ("Orbital-specific mapping of the ligand exchange dynamics of Fe(CO)5 in solution"). The team carried out their measurements on iron pentacarbonyl (Fe(CO)5), a metal complex in which an iron atom is surrounded by five carbon monoxide groups. This yellow liquid is used as a primary material for synthesizing organometallic compounds and may also function as a catalyst. Fe(CO)5 has 18 valence electrons and is therefore inert like a noble gas, but can be activated by light. Photons cleave off a carbon monoxide so that the remaining Fe(CO)4 molecule only has 16 valence electrons making it a so called 16-electron catalyst. Such homogeneous catalysts can be potentially used in converting methane to methanol, for example. Fe(CO)4 is highly reactive, however, only as long as it is in the singlet state. If the molecule is instead in the triplet state, it remains inert and does not form further compounds according to the laws of quantum chemistry. The study demonstrates how atom-specific probing of the frontier-orbital interactions uniquely enables correlating quantum-chemical properties of the system with its reactivity. Twenty-one researchers from eleven research institutions participated in the research project – many of them within the Helmholtz Virtual Institute “Dynamic Pathways in Multidimensional Landscapes”. Alexander Föhlisch provided the unique expertise in time resolved resonant inelastic X-ray scattering with his 2009 established institute at HZB and Potsdam University. The experiment was set up by the PhD student Kristjan Kunnus with Philippe Wernet and the team at HZB and in collaboration with Simone Techert and her group, then at the Max Planck Institute of Biophysical Chemistry in Göttingen, now DESY and Goettingen Research Campus, who also brought in the chemistry expertise and liquid jet technology. After characterization at BESSY II all was shipped for 60 hours measurement to the x-ray free-electron laser LCLS of the SLAC National Accelerator Laboratory in the USA. It involves what is known as a pump-probe scheme in which a very short laser pulse in the optical region excites the valence electrons of the molecule (pump), while soft X-ray pulses arrive a well-defined time delay in the femtosecond range later and probe the system for information. Michael Odelius’ team and his PhD student Ida Josefsson at the University of Stockholm modelled the compound and its excited states using quantum calculations over the following years. Only after these calculations were made could the data be interpreted to such a level of detail that the experimental observables could be unambiguously correlated with chemical interactions in the system. “We had created basically four-dimensional data records with new coordinates of the incident energy, transferred energy as well as the intensity for various time delay between pump and probe pulses of every hundred femtoseconds”, explains Kristjan Kunnus. The results also show the extent to which the spin states of the electrons determine whether the molecules transition to reactive states or not after being excited by the sunlight. This is essential because actually both possible spin states, in the present case, were found to be represented due to the ultrafast transitions between singlet and triplet states. 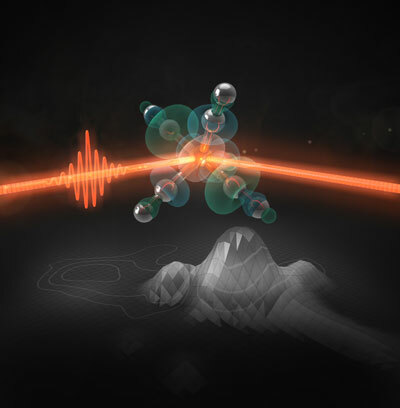 The measurements are a first step toward development of multidimensional X-ray spectroscopy in order to measure chemical dynamics on pulsed X-ray sources like Free Electron Lasers or BESSY-VSR. “Now that we understand the reaction kinetics, we can control them or design a system to favour desired reactions, for example, in order to chemically store solar energy”, according to Wernet.